Originally posted: September 10, 2018 . Last modified: September 18, 2018 . 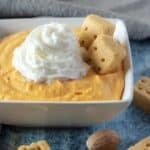 Fall themed parties will soon be upon us, and you’ll need a great pumpkin dip. Why not try a festive party dip that’s sure to please any pumpkin lover? There are some who feel it’s a little too early to start sharing pumpkin recipes. Well, my answer to that is MOAR pumpkin recipes, of course. Kudos to you if you get the reference, if not, just pretend I typed more. Now, let’s move on to the real reason you have decided to visit us, the pumpkin dip. It’s creamy, sweet, and one of my favorite dessert dips. Personally, I feel shortbread cookies make the perfect dipping items to enjoy this pumpkin themed sweet treat. With that being said, you can use whatever you like, from graham crackers to chocolate dipped pretzel sticks, use any dipper you desire. Now, if you follow our blog, then you know we love dips! They are easy to prepare, delicious to devour and encourage people to mingle at parties. Everyone crowds around a great party dip. It’s kind of like the old water cooler at the office. You can spend time chatting with friends while enjoying a great dish. No matter the style, you can’t go wrong with a well-made party dip. If you’re looking for something savory then check out some of the links below. In meantime, let’s get down to business! This is a pretty simple dip to prepare, it only takes about three different steps from start to finish. Just make sure you get the cream cheese out of your fridge in time for it to soften. In fact, that happens to be the first step, and as you will see, there are only two more steps after that one. First, remove the cream cheese from your fridge at least one hour before preparing the dip. We usually let the cheese soften for an hour to cut down on mixing time. Otherwise, you’ll waste a lot of time whipping out all those little lumps of unmixed cream cheese. 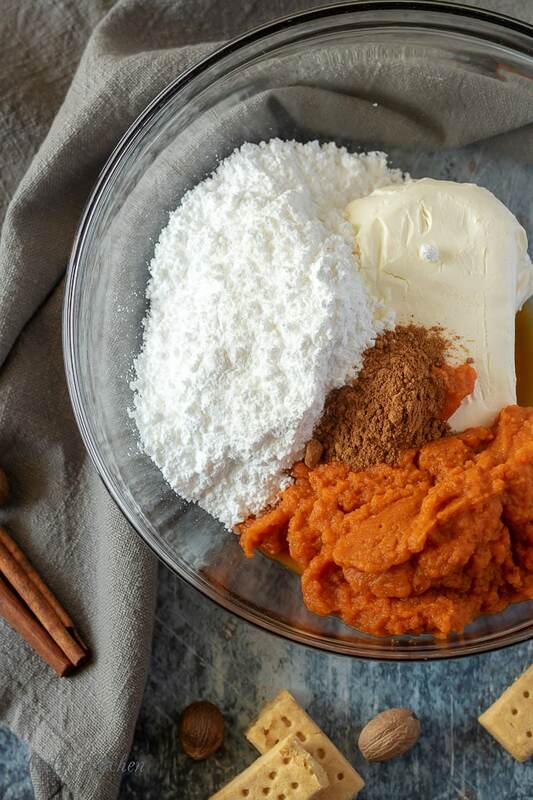 Next, combine the pumpkin pie spice, sugar, vanilla extract, salt, canned pumpkin, and cream cheese in a large mixing bowl and blend them. You may notice in the video that Kim added the canned pumpkin last. That was a mistake, it should be added with everything, all at the same time. Don’t worry, we will be remaking the pumpkin dip video in the coming weeks to correct that issue. Last transfer the dip to a serving bowl, top with whipped cream, and use shortbread cookies, graham crackers, or pieces of cooked pie crust for dipping. That’s it, you’re done. It doesn’t get much easier than that to make a dessert. Due to the simplicity of the dish, it really is the perfect party dip. You can throw it together right before everyone arrives, if you’re the host, or just before you leave to go to the get-together. Either way, pumpkin lovers will not be disappointed. Not a fan of pumpkin, try it with sweet potatoes and reduce the sugar amount. We haven’t tried this ourselves, but since I enjoy sweet potato pie, I can imagine the substitution would work here, as well. When your mixing the ingredients, stop the mixer once and give the sides of the bowl a quick scrape with a rubber spatula. It will make sure that all those spices get well-combined with the rest of the pumpkin dip. If you feel the pumpkin dip is too heavy, then fold in some whipped cream. The addition of whipped cream will lighten the dish, both in color and texture. Try this dip using our Homemade Pumpkin Pie Spice. Check these savory dip recipes: Seasoned Beef Queso Dip or Slow Cooker Spinach Artichoke Dip! 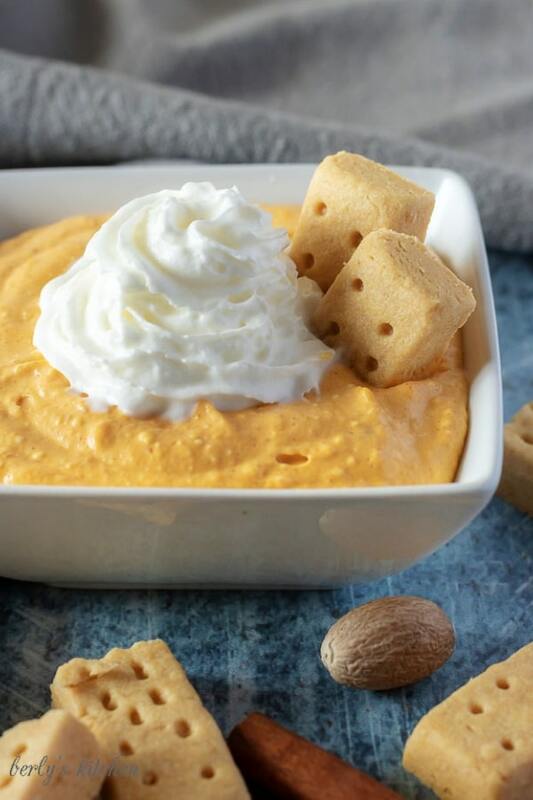 Fall themed parties will soon be upon us, and you'll need a great pumpkin dip. 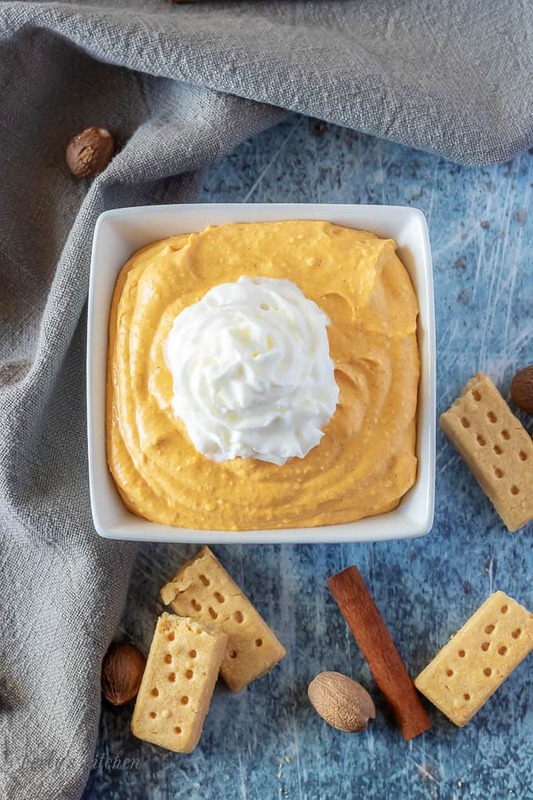 Why not try a festive party dip that's sure to please any pumpkin lover? First, remove the cream cheese from your fridge at least one hour before preparing the dip. Next, combine the pumpkin pie spice, sugar, vanilla extract, salt, canned pumpkin and cream cheese in a large mixing bowl and blend them. Last transfer the dip to a serving bowl, top with whipped cream, and use shortbread cookies, graham crackers, or pieces of cooked pie crust for dipping. The calories listed are an approximation based on the ingredients. The prep time does not include the amount of time needed for the cream cheese to soften. 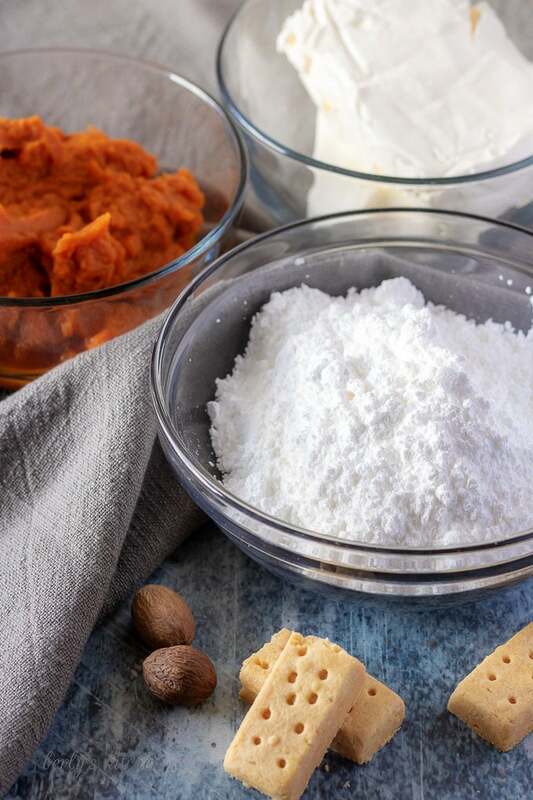 Our pumpkin pie party dip can be placed in a sealed container and stored in your fridge for up to three days. *A half batch of pumpkin dip was made for video purposes. I am SO beyond ready for pumpkin season. I mean, how can I not be after seeing something that looks this good!? I knew that time was coming up again! Pumpkin time! lol. I am one of those weirdos who doesn’t like pumpkin! Every year my friends say they are going to denounce our friendship when I remind them I can’t stand the taste! But, with that said, while I may not try this dip, I will certainly be sharing it with my pumpkin loving friends! Thanks for sharing! YUMMY!! I for one can not wait for pumpkin season! Actually I think the pumpkin spice lattes are already available at our local Starbucks to be totally honest with you. Fall is one of my favourite seasons and this dip looks delicious! Question for you, could you (or have you) swap out the vanilla in this recipe for nutmeg or all spice? Thank you, Heather! It’s funny because that opening paragraph was in response to someone on social media sharing the post but “screaming” about it being too early for pumpkin lattes. Which, I found hilarious because that person was so quick to complain while at the same time promoting the recipe lol! In regards to your question, the pumpkin spice already has nutmeg in it and unless you really like nutmeg, I wouldn’t suggest adding more. The allspice would probably work, but I would add tiny amounts at a time and taste it between additions. Thanks again for commenting and have an awesome Saturday! I have made something similar to this, and it is so yummy! I am ready for pumpkin season, and I have been craving pumpkin recipes for a few weeks now. I will have to make this for an upcoming get together because it’s so good! I am so ready for fall weather, fall smells and fall food!! It has rained here in Dallas for about an hour today and yesterday and it is our smallest little glimpse of cool weather being at arms reach! 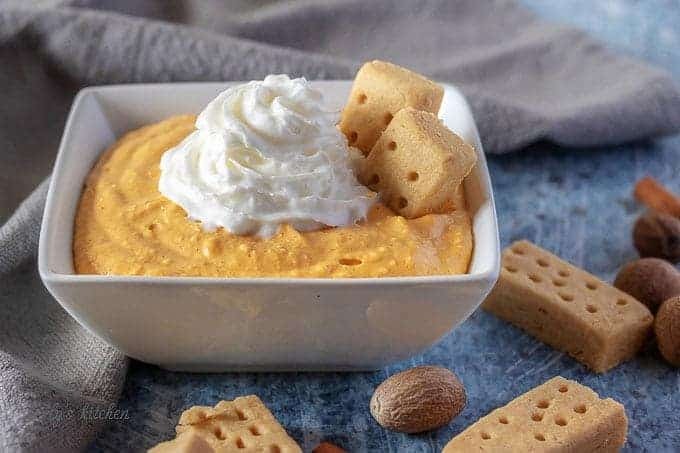 This pumpkin dip is PERFECT for get togethers and just because. Oh, I can’t wait to make this! I love all things pumpkin! So happy that the pumpkin season is just around the corner. The best recipes, events and weather come with pumpkin season!! I am adding this to my party list. Pumpkin season cannot get here fast enough for me. It means Fall and that’s my favorite! Your recipe looks delicious and I love that there are only seven ingredients! Pinning this to my Seven Ingredients or Less Board on Pinterest! I probably would have creamed the first few ingredients before adding the pumpkin anyway but either way, it will be delicious! I am beyond thrilled for this recipe! I hate pie crust but love pumpkin pie filling. I know, crazy but true. I started making a graham cracker crust for sweet potato pie – that’s how much I hate traditional crusts. This looks like I just need a spoon and I’d be in fall heaven. This sounds like an amazing treat! I love this season! Add one more pumpkin thing to love! Probably the one thing I look forward to every Fall……PUMPKIN everything! I love the Fall for several reasons, ultimately because I love a lot of pumpkin-related stuff! I’ve been a pumpkin everything lover since I first took a sip of pumpkin spice cappuccino many years ago! 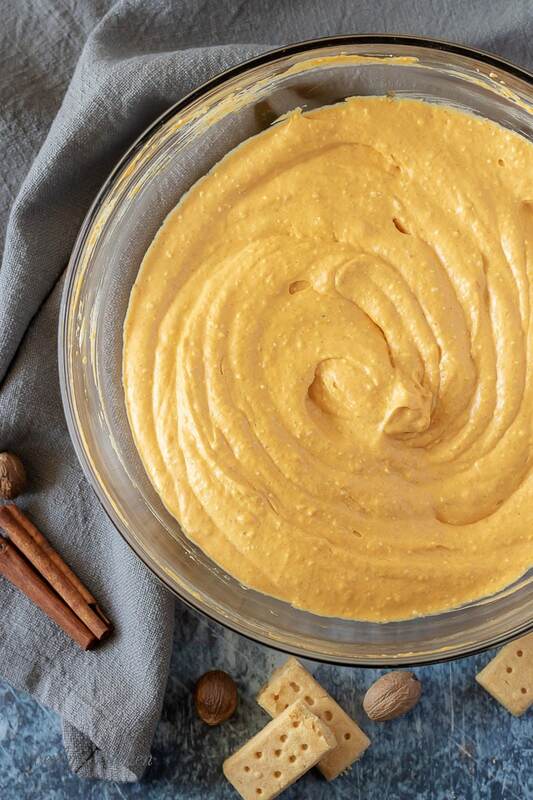 You had me at pumpkin pie dip! This recipe looks absolutely delicious. I can see any party being a huge hit with this dip. I know I would have to make lots, as my invitees love to eat lol. What a great recipe for fall. I love this time of the year. Great weather, fashion, events and FOOD!! I cannot wait to try this fun recipe for one of our fall events.